• It usually happens when the completed craft is sold by the manufacturer to the person who is going to use it or a dealer for further distribution. • It also happens when the completed craft is used for the first time, as in the case of a Home build or added to the manufacturer’s charter fleet. • With imported boats it happens when it clears customs because it is then available for use or distribution. • This is the point when the completed craft must comply with all the requirements of the RCD. The requirements apply equally to businesses and private individuals. Reference to the RCD in these notes means the UK Regulations. • A declaration of conformity. Boats must also comply with the Boat Safety Scheme (BSS) requirements before they can be used on most of the UK’s waterways. Look at the BSS web site for more information. Every new boat sold or first used in the EU since 16 June 1998 must have a builder’s plate. This plate has the maker’s details and technical information such as the design category, maximum loading weight and engine power. It must also include the CE mark. 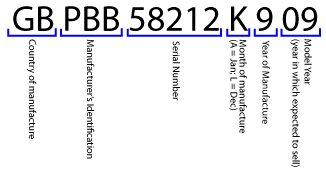 The Craft Identification Number or Hull Identification Number (HIN) as it used to be called, is unique to that craft. It is a code that identifies not only the builder, but where and when the craft was built. It will look similar to the illustration below and is found in two places. One is found on or near the transom, starboard side, near the top. The number should be on the right hand side as you face forwards somewhere near the stern fender. The other is hidden as a security check. It should always be 14 alphanumeric characters in length, no more and no less. The “Model Year” must always be of equal or later date than the year of manufacture, never earlier..
New boats must have an owner’s manual. As all the required information is in the original owners manual, always ask to see it. You should also have the manuals for any equipment fitted for the same reasons. The owners manual must also contain an important legal document called a Declaration of Conformity. This document is issued and signed by the manufacturer, or his agent or the importer. It is part of the CE marking requirements and is one of the Documents that may be asked for and examined by any of the EEA Enforcement Authorities. Very important if the craft is being used in Europe. If a craft is being offered for sale without one of the five items you could have real problems if you buy it! • Any craft already in use in EEA waters before 16th June 1998. • Any craft under 2.5m or over 24m. • Any craft on the list of exemptions and, usually labelled such as racing boats, historic craft and hovercraft. However in most cases the exemption has conditions. A craft can lose the exemption if the conditions are broken and will need to meet the full requirements of the RCD. This is a complex area to give general advice on. Each case has to be examined and decisions made on an individual basis. Any boat, new or used, imported into the EEA since June 16 1998 is regarded as being a craft new to the EEA market.This means it has to meet all the requirements of the RCD before it can be used. The full RCD only applies to completed craft. However, it is not always easy to say when the craft is complete. The craft is complete when the manufacturer has completed the conformity assessment, applies the CE mark, and signs the Declaration of Conformity. If the craft is not complete, it must have a document called an Annex IIIa declaration. This basically says that the boat is for completion by another but it meets the requirements of the RCD as far as they apply to what has been completed so far. These are often described as ‘Sailaways’. When the boat is finally complete, the last person in the chain, termed as the manufacturer, is responsible for making sure the boat complies with the RCD. • Not further placed on the market for at least 5 years. Further placing on the market means selling on, but by putting the craft up for charter it breaks the ‘exclusively for own use’ condition. It is very common for a private individual to buy a shell or sail-away and fit it out themselves. These are recognised as Home completed craft provided that they meet the same conditions of a home build, exclusive use and the 5 year rule. The clock starts ticking from the first time it is used as a recreational craft on the water, not necessarily from when it is fully completed, with all the furniture and carpets. Ask the owner for any proof that the non-CE marked home built or completed craft has been in use for 5 years. This proof could include BSS certificates, inland waterways licences or mooring, launching and docking receipts. • The enforcement authorities of any EEA Member State can take action to remove a noncompliant boat from their waters. • Most non-compliant boats can be made to comply, but there is a cost involved. It could be you that foots the bill. • A non-compliant boat is not worth as much as a compliant one. • Your insurance cover may be invalid. • The BSS certificate could be revoked and you will not be allowed to use your boat. • A non-compliant boat never gains compliance just because it has been used for some time. • From the 1st January 2006, inboard petrol and diesel engines must have type approval and meet strict emissions and noise levels. It is unlikely that a used engine will be able to meet the requirements. • to look for the 5 items listed in the opening section above. • If they are not there, then ask why not. • All new recreational craft must be comply with the Recreational Craft Regulations 1996 or 2004. • An exempt boat complies with the RCD provided all the conditions are still being met. It does not need to be CE marked etc. • Check the answer given with your surveyor, the RYA, BMF, DTI or Trading Standards Service. • Buying through a broker, who is also a member of the BMF or ABYA. • If you buy privately – buyer beware! Check everything very carefully and have a survey done. If the craft does not comply with the RCD and does not fall into one of exemptions, walk away. Some bargains are not worth it! This information has been adapted from guidance issued by Hampshire Trading Standards. It is designed to provide basic guidance to consumers. It is not a complete or authoritative statement of the law.